Usually if an OVA comes out, I wait until a new season airs before writing anything about it. 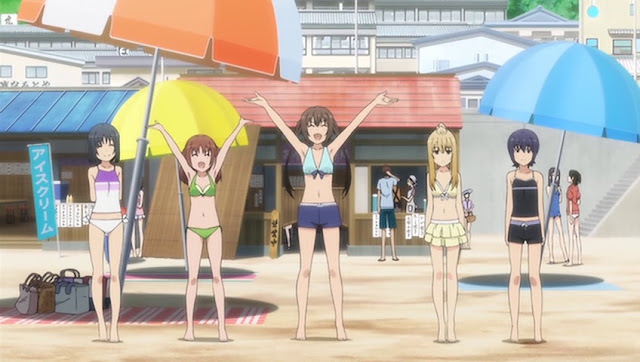 But this looks like it might actually be the last time we see the loveable cast of Minami-Ke in animated form. And sadly, it’s just a typical piece of fluff with the usual beach episode clichés. A group of the girls go to the beach and splash water at each other, except the quirky ones who give us some light character-based comedy. A couple of the girls have collected beetles, still an enduringly popular activity for kids in Japan, and of course they manage to get loose, causing not mayhem but some light tension between siblings. Over the short run-time of the episode, just about the whole cast is visited briefly, allowing for some nice pleasant scenes reminding us of their personalities before we finish on possibly the most perfect, ridiculous character to conclude an entire series with. Chiaki gets the most screen time, struggling to complete an athletic task set as part of her summer homework. It’s a light, fun, cute thing to watch, her doing her best and failing a lot, but not exactly thrilling. My favourite characters get very little to do. Touma gets to be girly for a change with the others at the beach, and has a funny little bit where she gives her beetle the same name as her brother, but there’s little more to it than that. Poor Mako-chan shows up to play and quickly gets turned away. The comedy based around these two characters defying gender norms was the reason I really enjoyed the show, but we didn’t get any of that. Still, nice to check in with these characters again, and a little sad to think it might be the last time.